What’s it about? B.J. 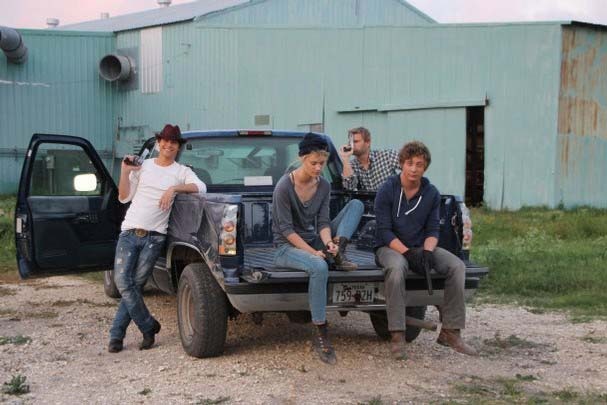 (Logan Huffman) steals thousands of dollars from his boss Giff (Mark Pellegrino) in order to give girlfriend Sue (Mackenzie Davis) and best friend Bobby (Jeremy Allen White) a huge send-off before they leave Texas for college. However, the teens soon realise that B.J. has messed with the wrong guy and are forced to commit a mass robbery in order to get themselves off the hook. Verdict? We Gotta Get Out Of This Place certainly begins with potential; while the narrative isn’t the most original, the backdrop of a run-down, cotton-mill town in Texas is endearing and gives a real sense of the boredom these characters face in their day-to-day lives. The humdrum feel of the cinematography and drab colours throughout make B.J.’s excitement at stealing the money conceivable, despite the fact his boss is a known crook. And B.J.’s underlying bitterness at being left behind by Sue and Bobby as they leave the town to embark on exciting new lives in college is also apparent throughout, however, from the outset, Huffman’s portrayal of his bad-boy character is cliched and at times overbearing. It is almost as though B.J. has been created from a checklist of rogue-outsider stereotypes; he drawls his words, has by far the strongest Texan accent of the three leads, walks with a swagger, and often falls into the depths of self-pity whilst talking about his troubled childhood. In short, to set B.J. apart from Bobby and Sue, he is their polar opposite – they are academic and brainy, discuss books, and have seemingly cosy family lives; B.J. is the outsider. When B.J. consequently discovers that Bobby and Sue are having an affair, the film goes downhill. Confused between a cheap revenge thriller and an amateur crime drama, the film teeters in and out of different genres leaving no real mark on any. The plot slowly becomes more and more unbelievable as the characters plod gingerly through the story without a hint of development. The lack of regard you feel for them is only reinforced by how unlikable each of them is – despite it being clear that Sue and Bobby are supposed to be the good guys, you can’t feel any connection towards them and the fact they had an affair behind B.J.’s back makes their morality just as questionable as his. We Gotta Get Out Of This Place gradually gets more and more outlandish with ridiculous twists thrown in to shock, adding to the growing list of WTF moments. The film’s final showdown is the most gripping part of the 92-minute run time as the pace is finally turned up a couple of notches and Pellegrino’s Giff has more screen time than the younger leads. Unfortunately, it is too little too late. Final Words: Though impressive at first, the film’s run-down backdrop only serves as a depressing foreshadowing of the tired plot and exhausted characters. We Gotta Get Out Of This Place would have done better sticking to one genre and one storyline. As it is, the film seems confused over whether the focus of the plot should be the teenagers paying back Giff or B.J. getting revenge on his cheating girlfriend, and this confusion means neither of the stories are enough to hold the film together.